Please note, only the user who created the account can delete it and deleting the account removes the entire organization. It is not reversible. Even if there are other admins listed for the account, all users/profiles will lose access. If you have more than one account attached to the same email address, it is important to make sure you are actively viewing the one you wish to remove. Otherwise, you could delete the wrong account and it cannot be recovered. 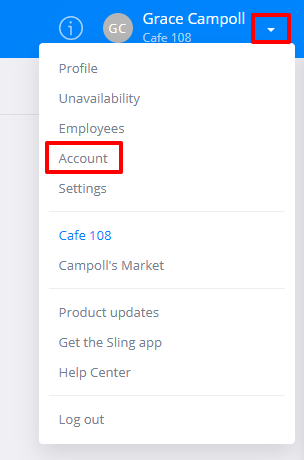 If you have more than one account, you can view instructions on how to switch between them here. First, you will want to log in from a web browser at https://login.getsling.com. Click your name at the top right corner of the page and select Account. You’ll see the option to delete the account here. After clicking Delete account, you'll be asked to verify your password. Once it's been entered, you'll see confirmation that the account has been removed. If you're an employee, you'll need to contact the creator or admin of the account to have them remove your profile for you.